Wedding season in full swing now. Just keep up with releasing more wedding photography stories. Today I will share with you beautiful wedding at magnificent Mansfield Traquair. It was lovely to be back there. Fantastic team of people and you are always so well taken care off. Thumbs up. Rest of the great suppliers who helped Saraid-Jane and Stuart to make this day special. A little bit about the day. I loved many parts of the ceremony :) I loved how both of them Saraid-Jane and Stuart talked about Stuart’s jokes which apparently are not funny :) it made a lot of giggles in the room. I really loved the reading about dinosaurs. I think it was really sweet and awesome. Treasure that book guys. Story was beautiful. Morning part with girls was filled with laughs and Mr and Mrs Newton were busy prepping up everything in kitchen. I loved how relaxed was Mr Newton, very cool and so happy for his daughter. When Mrs Newton said that she made her dress, I was like whaaaat?! Wow it looked amazing, I must say. Stuart is quiet serious man, but boys had fantastic morning with my second photographer. By looks he tried to keep his cool :) You could see that closer to ceremony he started to be pretty nervous. During our creatives photos part, I scouted few places where to go for photos. We found nice little place with garage doors. I quiet liked that. We also got access to private garden and during the session older lady came to me and said if I want, I could use her garden too :) I think it was very nice of her. We create many fantastic images during that 40 min window. It is always flies by, but since we have done scout and pre wedding photos, guys are more relaxed about whole process. Big congratulations to Mr and Mrs Houston!!! 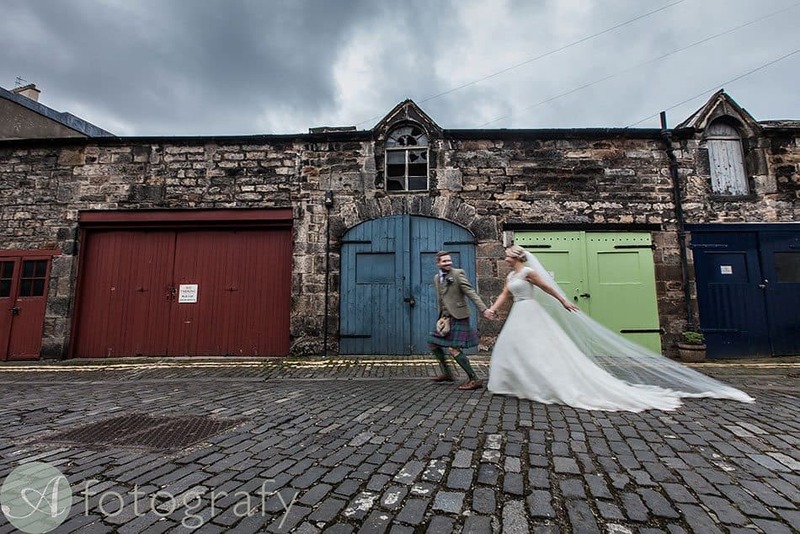 Lets have a look at their Mansfield Traquair wedding photography story.